After sitting out three races following the death of Kevin Ward Jr., Tony Stewart's hopes of racing for a fourth title hinge on a victory at Richmond Saturday. CHARLOTTE, N.C. (AP) — Tony Stewart has one final shot to make the Chase, and it’s not a very good one: He must win Saturday night at Richmond, where he last visited Victory Lane in 2002. He sat out three races after his sprint car struck and killed Kevin Ward Jr. at a New York dirt track on Aug. 9, and his return to competition Sunday night at Atlanta Motor Speedway ended with a blown tire and a 41st-place finish. Now the three-time NASCAR champion has to win at Richmond or he won’t be eligible to race this season for a fourth title. But does it really matter if Stewart makes the 16-driver field? Stewart’s team and his employees and his sponsors would be thrilled if Stewart pulled it off, and it sure felt as if the crowd was pulling for him given his reception as he walked across the stage during driver introductions. Stewart received a rousing ovation that was far louder than for any other driver, even the wildly popular Dale Earnhardt Jr. So when his tire blew and he hit the wall, ending his night just past the halfway point, there was heavy sadness in his voice as he radioed his crew. Only the finish wasn’t that important in the grand scheme of life, which Stewart is beginning to understand in the aftermath of Ward’s death. Returning to the track was imperative for Stewart, who had spent nearly three weeks in seclusion. Many of his peers tried and failed to comfort him; Stewart simply wasn’t ready to talk or text or let anyone into his world of constant sorrow. Kahne finally got his chance Friday after Stewart returned to the track, made his first public statement since Ward’s death and then finally headed to his home-away-from-home in the NASCAR motorhome lot. Kahne was waiting. Those friendships and support are what Stewart needs most right now. He needs normalcy and routine and the distraction of pulling on his helmet and climbing in a car. The investigation into Ward’s death will last at least another two weeks, and criminal charges are still possible. So it’s foolish to think one weekend at the track did anything to make his problems go away. 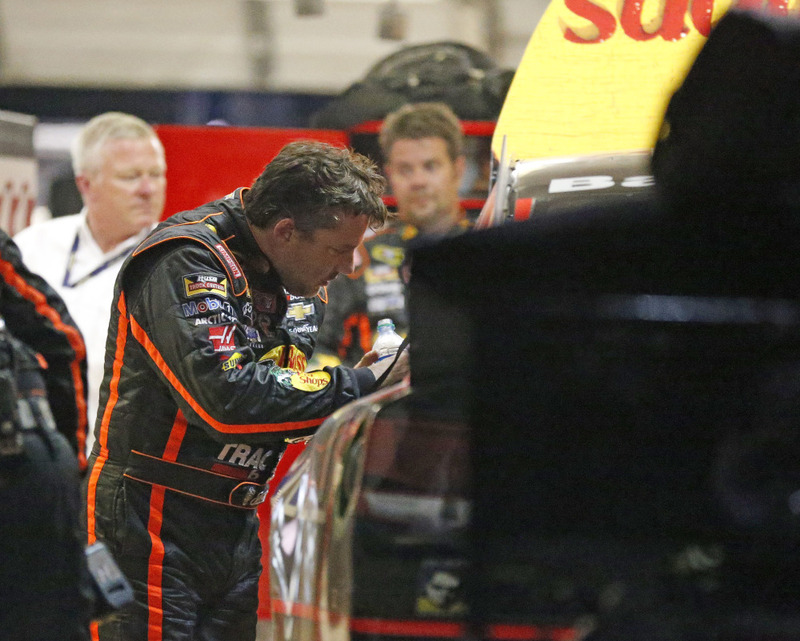 Many will always scrutinize the timing of Stewart’s return. He came back with two races remaining in the “regular season” and after Stewart-Haas Racing had successfully petitioned NASCAR for a waiver that would allow him into the Chase should he qualify. A focused driver in a fast car with two chances to gain that important berth? Sure, the motives behind his return will seem questionable to some. But many outside the celebrity world are touched by tragedy daily, and few get to simply shut down and grieve indefinitely. There are jobs, children, responsibilities and lives that go on. When something terrible happens, eventually it’s time to return to work. That’s all Stewart did last weekend. There was never going to be a “right” time for Stewart, but it was inevitable he’d be back. Racing is his job, his hobby. The race track is his home. The longer he stayed away, the longer the delay in the healing process. It’s not important if Stewart makes the Chase, it’s just not. Moving forward and trying his best to pick up the pieces is all that matters now, and that made Sunday’s race something of a small victory.